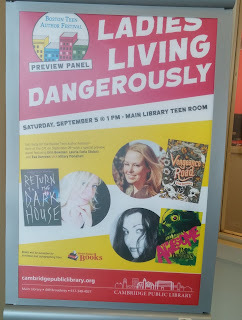 So I know this is a bit late, but Saturday, September 5th I went to a Pre-show of The Boston Teen Author Fest: Ladies living dangerously, with Erin Bowman (Vengeance Road), Lauria Faria Stolarz, (Return to the Dark House), and Eva Darrows AKA Hillary Monahan, (The Awesome) Held at the Cambridge Public Library. The authors had a great panel, and answered a lot of really interesting questions, mainly about female roles in books, the evolving of YA and how it came to be, and feeling the need to include romance in their books. There was deep conversations about feminism an what a "strong female character" entails. And then about violence, grey characters, and overcoming ones fear. It was such a great panel! Seriously, I wish I recorded it! 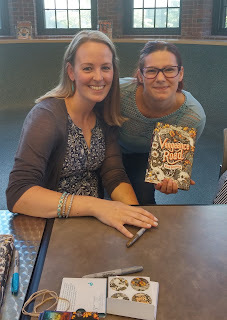 I also got a picture with the lovely Erin Bowman! 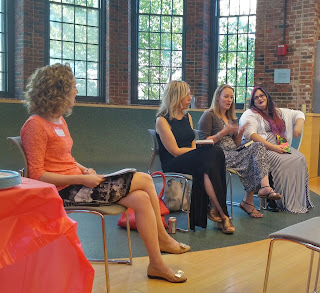 This event was actually a teaser/ pre show for the upcoming Boston Teen Author Fest coming up September 26th. I'm so excited to go. The line up is AMAZING, especially for a YA Fantasy fan like me. Twenty-eight Authors so far are confirmed to go.